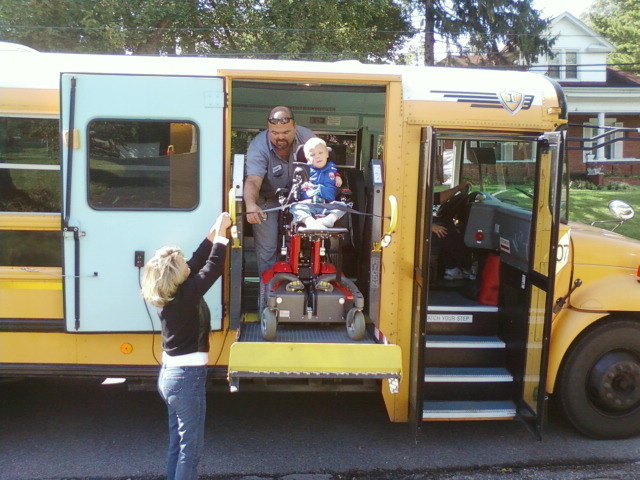 Well, today marks a big day: Drew rode the bus to school for the first time. This was an arrangement we made recently to transport Drew and his wheelchair to school. Now, Drew can ride in his chair to the playground, gym, therapists’ offices, etc. instead of being pushed around in a stroller. I’m sure Drew appreciates the independence and the attention as the entire class had to come see ol’ Red. Drew was delighted to ride the bus as even when he first started school he admired the big yellow bus each morning on our way out to the car. I, naturally, was a little anxious about Drew’s sudden change of heart should he prefer to ride to school in Mama’s car. I was a little more anxious that the wheelchair lift ride onto the bus would be too much of a scary experience for Drew, but Drew would soon put my mind at ease. terrain, and there was a time that I left it on my porch (on a sunny day) for over an hour. I can’t help it, but I’d be less upset if I wrecked my own car, a car that I pay for. However, we are making arrangements to have the electronics fixed in which case Drew will ride the bus strapped to his chair. In the meantime, Drew rides in a bus seat behind the driver. The day started off calm and normal for me until I saw the flashing light from the bus waiting outside on the curb. The fact that I hadn’t even gotten Drew out of bed yet really sent me into a frenzy. My plan was to have him dressed, teeth brushed and waiting outside on the driveway in just enough time to watch the bus pull aside us. So, I rushed to dress Drew, skipped the teeth brushing (it’s OK, the kids brush their teeth at school) and quickly got Drew outside. They loaded Drew up with minimal difficulty. Drew seemed nervous about the lift but the staff comforted Drew and his nerves lightened even before the ramp had reached its peak. It was tricky getting the chair turned into its appropriate resting place. I’m sure the cars waiting behind the bus were none-to-pleased with our delay as we hooked it all up. I’m sure that it will get quicker and quicker every day. Of course, I followed the bus to school so I could watch Drew unload and he did great, like he’d figured everything out in one shot. Of course, I had my phone at my side all day in case the teacher called in a perplexed panic about the chair and its many buttons. Turns out, there was a brief moment of confusion getting their chair into drive mode. The teacher explained that they both were trying to convince the other to put the chair into drive mode. I had a funny image of the teacher trying to play it sly as Drew quizzed her about changing the mode of the chair. Not wanting to sacrifice the “teacher knows everything” reputation, she coyly gazes down at him and instructs him to change the mode as if she were evaluating his expertise. But, the mystery was solved with no help needed from me. 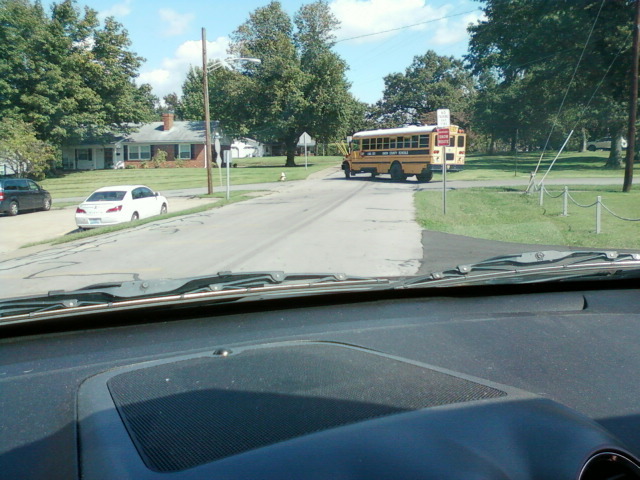 After school, I wanted to see Drew get onto the bus this being only the second time and all. It went without any injury, damage or panic. Drew was hooked up and I followed the bus home. 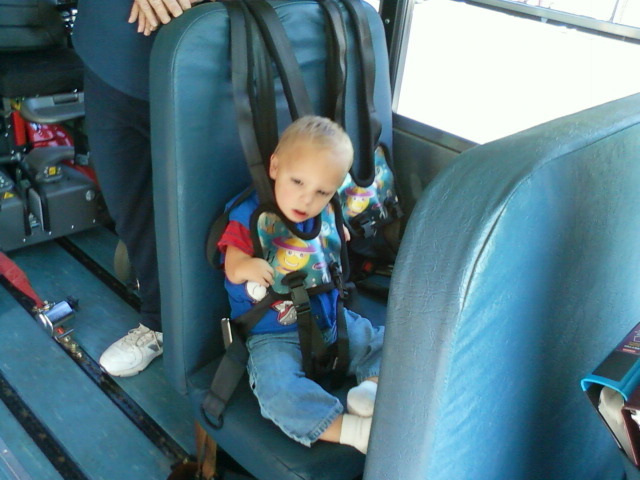 Drew was very excited to have ridden the bus as he bragged about it to anybody who would listen for the rest of the day. It was a good day and Drew is excited about going to school even more now. Now, perhaps we’ll get a vehicle to transport the chair to places and it won’t be such a challenge going shopping! AWWWWWWWWWWWW that even got me all choked up! Go Drew! Emma and I are so proud of u! I can’t believe how lucky we are to be ur neighbors and ever since Emma heard Drew is riding the bus she hasn’t stopped asking when she can ride with him.